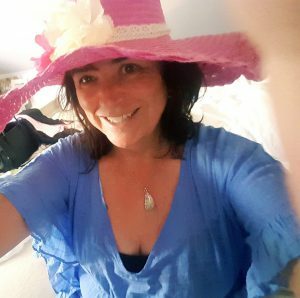 As I write this I realise it has been exactly (to this date) six years since I broke the news to the world that I had been diagnosed with Breast Cancer. What is even better I only realised this as I was reminded by a comment on Facebook made six years ago, so I would call that progress not remembering the actual date. It means while cancer will always be a part of me it will never define who I am. I was in touch with the Marie Keating Foundation literally two days after being diagnosed and a lovely lady called me, Yvonne, she was so kind and spent a long time talking to me over the phone, she had been in the same situation as me, was working had a family and she so reassured me and was just lovely to talk to someone who had been in the same boat. I was also lucky enough to be asked to be on the runway for the Survive and Thrive annual Fashion Show for the Marie Keating Foundation. Well what a night it was, it was just fantastic up there on the stage, strutting my stuff with the other ladies and celebrating our achievement. I met so many great women on the night and some I am still in contact with. Around two years later I was asked to be part of the Survive and Thrive Workshop. This was the first workshop that had been held and around 12 people attended these workshops over a course of six weeks. I found this to be absolutely fabulous and a great way of coping with “after cancer” that time in your journey when all treatment is finished and you wonder what the hell happened and what the hell happens now. The workshops were great and I was delighted to be asked to be part of the Out the Other Side Campaign with nine other lovely ladies where we were proudly on billboards in Stephens Green, and all the major hospitals around Ireland each of us telling our stories. The friends I have met through The Marie Keating Foundation are friends for life and friends who understand exactly what happened. Life is great now. I have done so much in the last six years including organising the Worlds Largest Skinny Dip and being a World Record Holder along with 2,504 other beautiful, naked, wonderful women. Raising over €605,000 for cancer to date, the annual Skinny Dip has been my Christmas Eve for six years now. On reflection and its only when I put pen to paper (or strokes to laptop) I realise just how important the Marie Keating Foundation was for me. It gave me hope, support, opportunities to celebrate and share with other people our journeys and most importantly it gave me my “cancer chickkies” – new friends for life. Thank you Marie for the legacy you have left and all that work in your memory you have changed so many peoples lives. This entry was posted in Latest News and tagged Awareness, Breast Cancer. Bookmark the permalink.